William Profit(t) and his wife Isabella Joyce lived the first 40 years of their lives in Tynemouth, Northumberland, England. William was a stonemason and they were members of Christ Church (Church of England) in Tynemouth. They had 6 children. Within one year of his father's death, William emigrate from England to PEI in 1821. He brought all of his living children and the family's grandfather clock. The clock had a prominent place in the Stone House, William and his son's built, on the Country Line Road in Irishtown - Burlington for the next 150 years. 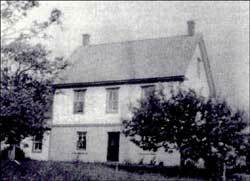 William, John, and Margaret stayed near the family home, settling in or near the Stone House. A Profit lived on the homestead for the next 150 years. The other two boys, George and James moved to Prince County living in Alberton and Bloomfield. The Profit family continued to grow in PEI. They married with the Champion, Beairsto, and MacArthur families. Around the turn of the 1900's the family moved to Massachusetts and western Canada to find work. Some questions remain: Why did George and James move to Prince County while their siblings stayed in Queens County? Why do some of the Profit's spell their last name with one t while others use two t's? View Will of William Profit, Jr. The author would like to publicly thank Syliva MacDonald, Ron Profit, and Toni Profit Davis for their help in this registry report. The author also has additional generations to share dealing with the ancestors of William Profit, Jr.
1. WILLIAM4 PROFIT JR. (WILLIAM3, JOHN2, UNKNOWN1) was born 1778 in Swalwell, Whickham, Durham, and died August 25, 1852 in Irishtown, Prince Edward Island. He married ISABELLA JOYCE EVANS November 17, 1805 in South Shields, St. Hilda, Durham. She was born 1774 in Durham, England, and died May 01, 1854 in Irishtown, Prince Edward Island. i. MARGARET5 PROFIT, b. Abt. 1805, Northumberland, England; d. Abt. 1805, England. 2. ii. WILLIAM HALL PROFIT, b. 1807, Northumberland, England; d. August 05, 1874, Irishtown, Prince Edward Island. 3. iii. JOHN PROFIT, b. 1808, Northumberland, England; d. November 23, 1890, New London, Prince Edward Island. 4. iv. GEORGE PROFIT, b. January 13, 1811, Northumberland, England; d. February 10, 1890, Alberton, Prince Edward Island. v. MARGARET PROFIT, b. 1813, Northumberland, England; d. 1861, Fermay, Prince Edward Island. 5. vi. JAMES REGINALD PROFIT, b. 1815, Northumberland, England; d. 1889, Bloomfield, Prince Edward Island. vii. RALPH PROFIT, b. 1818, Northumberland, England; d. 1820, Queen St. Tynemouth, Northumberland, England. Built in the early 1800's, this one story stone house was built by the Profit men who were stone masons. The top story, built of wood was added in 1851. 2. WILLIAM HALL5 PROFIT (WILLIAM4, WILLIAM3, JOHN2, UNKNOWN1) was born 1807 in Northumberland, England, and died August 05, 1874 in Irishtown, Prince Edward Island. He married MARGARET GRANT 1827. She was born 1809 in Summerside, Prince Edward Island, and died April 22, 1881 in Irishtown, Prince Edward Island. i. JOHN6 PROFIT, m. (1) ANNA BELL MACEWEN; m. (2) MISS CUNDALL; m. (3) MARGARET DAVIDSON, 1864; d. 1866. 6. ii. BARBARA PROFIT, b. December 14, 1829, Lot 20, Prince Edward Island. 7. iii. ANNA MYRIAH (MARIA) PROFIT, b. August 18, 1832; d. December 11, 1895. 8. iv. MARY JANE PROFIT, b. January 11, 1837; d. 1927. 9. v. WILLIAM HALL PROFIT, b. 1838; d. 1868. 10. vi. MARGARET PROFIT, b. 1843, Prince Edward Island. 11. vii. ELIZABETH PROFIT, b. March 11, 1844. 3. JOHN5 PROFIT (WILLIAM4, WILLIAM3, JOHN2, UNKNOWN1) was born 1808 in Northumberland, England, and died November 23, 1890 in New London, Prince Edward Island. He married (1) ISABELLA PAYNTER, daughter of RICHARD PAYNTER and ANN. She was born 1812, and died October 1846. He married (2) MARY ANN PAYNTER 1849 in Prince Edward Island, daughter of RICHARD PAYNTER and ANN. She was born 1816, and died 1900. 12. i. MARY ANN6 PROFIT, b. October 20, 1832, Prince Edward Island; d. February 22, 1920, Prince Edward Island. 13. ii. WILLIAM PROFIT, b. 1835. 14. iii. ISABELLA PROFIT, b. December 1836, Irishtown, Prince Edward Island. 15. iv. RICHARD PROFIT, b. December 27, 1838, Irishtown, Prince Edward Island. 16. v. JOHN HALL PROFIT, b. October 19, 1841, Irishtown, Prince Edward Island; d. 1908, Natick, Mass. 17. vi. MARIAH PROFIT, b. June 29, 1844.
vii. JOHN T PROFIT, b. August 1846; d. 1931; m. MARY ELLEN SMITH. viii. SARAH PROFIT, b. August 29, 1846, Lot 20, Prince Edward Island; d. 1846. 4. GEORGE5 PROFIT (WILLIAM4, WILLIAM3, JOHN2, UNKNOWN1) was born January 13, 1811 in Northumberland, England, and died February 10, 1890 in Alberton, Prince Edward Island. He married MARY CHAMPION, daughter of JOHN CHAMPION and BARBARA WARREN. She was born September 22, 1817 in Baltic, Prince, Prince Edward Island, and died August 1894 in Alberton, Prince Edward Island. 18. i. ISABELLA6 PROFIT, b. January 14, 1840, Prince Edward Island; d. 1915. 19. ii. BARBARA PROFIT, b. December 15, 1841, Lot 20, Prince Edward Island; d. March 07, 1894. 20. iii. WILLIAM PROFIT, b. April 11, 1844, Prince Edward Island. 21. iv. JOHN THOMAS PROFIT, b. July 18, 1846, Prince Edward Island; d. September 23, 1931, Prince Edward Island. v. BENJAMIN PROFIT, b. August 17, 1850, Lot 2, Prince Edward Island. 22. vi. JAMES HALL PROFIT, b. January 12, 1853. 23. vii. MARY ANN PROFIT, b. May 31, 1856. 24. viii. DAVID PROFIT, b. March 02, 1859, Tignish, Prince Edward Island; d. December 04, 1946, Providence, RI. ix. INEZ PROFIT, b. November 24, 1861, Prince Edward Island. 5. JAMES REGINALD5 PROFIT (WILLIAM4, WILLIAM3, JOHN2, UNKNOWN1) was born 1815 in Northumberland, England, and died 1889 in Bloomfield, Prince Edward Island. He married ELIZABETH BEARISTO. She was born 1815, and died January 02, 1879 in Montrose, Prince Edward Island. 25. i. WILLIAM6 PROFIT, b. April 08, 1840, New London, Prince Edward Island; d. March 04, 1904, Woodvale, Prince Edward Island. 26. ii. JAMES HALL PROFIT, b. December 20, 1841; d. August 1903. 27. iii. JOHN PROFIT, b. 1844, Prince Edward Island; d. Abt. 1916, Notick, Mass. 28. iv. DUNCAN PROFIT, b. February 27, 1845, Irishtown, Prince Edward Island; d. 1904, Bloomfield, Prince Edward Island. 29. v. ISABELLA PROFIT, b. March 22, 1850, New London, Prince Edward Island; d. Worcester, Ma. vi. GEORGE PROFIT, b. July 04, 1852, Prince Edward Island; m. (1) CATHERINE BEAIRSTO; b. 1841, Spring Valley, Prince Edward Island; d. 1929; m. (2) MARY (WARREN) BEARISTO. vii. THOMAS ARCHIBALD PROFIT, b. April 11, 1855, Prince Edward Island. viii. MARY ELIZABETH PROFIT, b. January 25, 1858, Prince Edward Island; d. October 08, 1938, Natwick, Mass. 30. ix. BENJAMIN BEARISTRO PROFIT, b. September 14, 1860, Fernroy, Prince Edward Island; d. 1911, Augustine Cove, Prince Edward Island. 6. BARBARA6 PROFIT (WILLIAM HALL5, WILLIAM4, WILLIAM3, JOHN2, UNKNOWN1) was born December 14, 1829 in Lot 20, Prince Edward Island. She married WILLIAM ELLIS. He was born October 20, 1826 in Prince, Prince Edward Island, and died October 28, 1873.
i. BISMARK7 ELLIS, b. July 18, 1873; d. September 30, 1873. 7. ANNA MYRIAH (MARIA)6 PROFIT (WILLIAM HALL5, WILLIAM4, WILLIAM3, JOHN2, UNKNOWN1) was born August 18, 1832, and died December 11, 1895. She married WILLIAM (OLD QUAKER) CAMPBELL, son of ARCHIBALD CAMPBELL and CHARITY URQUHART. He was born July 27, 1824 in Irishtown, Prince Edward Island, and died December 04, 1895 in Prince Edward Island. 31. i. WILLIAM HALL (YOUNG QUAKER)7 CAMPBELL, b. November 09, 1855, Irishtown, Prince Edward Island; d. March 05, 1919. 32. ii. ALEXANDER CAMPBELL, b. January 06, 1858, Irishtown, Prince Edward Island; d. March 29, 1906.
iii. SARAH ELIZABETH CAMPBELL, b. Abt. 1859, Irishtown, Prince Edward Island; m. ELLIS GLOVER. iv. CATHERINE JANE CAMPBELL, b. 1863, Irishtown, Prince Edward Island; d. December 07, 1892; m. JOHN WATSON BUTCHER COUSINS, November 02, 1880, Summerside, Prince Edward Island; b. November 06, 1855, Prince Edward Island. 33. v. JOHN ARCHIBALD CAMPBELL, b. September 09, 1864, Irishtown, Prince Edward Island; d. 1946.
vi. MARGARET ANN CAMPBELL, b. Abt. 1868, Irishtown, Prince Edward Island; d. March 02, 1887; m. ALEXANDER COUSINS. 34. vii. MARY RAMSAY CAMPBELL, b. August 04, 1871, Irishtown, Prince Edward Island; d. 1945.
viii. DAVID CAMPBELL, b. October 02, 1875; d. November 11, 1936; m. ELIZA MARTHA HARDY, September 25, 1900; b. April 16, 1877; d. May 05, 1974. 35. ix. JAMES ANDREW CAMPBELL, b. June 02, 1879, Irishtown, Prince Edward Island; d. 1953. 8. MARY JANE6 PROFIT (WILLIAM HALL5, WILLIAM4, WILLIAM3, JOHN2, UNKNOWN1) was born January 11, 1837, and died 1927. She married JOHN SUDSBURY. He was born 1833, and died 1925.
ii. MARGARET SUDSBURY, m. ALEXANDER COUSINS. 9. WILLIAM HALL6 PROFIT (WILLIAM HALL5, WILLIAM4, WILLIAM3, JOHN2, UNKNOWN1) was born 1838, and died 1868. He married MARY SYMMONS, daughter of JAMES SYMMONS and ELIZABETH. She was born 1833 in England, and died Aft. 1881.
i. EULALIA7 PROFIT, b. 1861, Prince Edward Island. ii. PROFIT, b. October 1864; d. April 1865.
iii. WILLIAM HALL PROFIT, b. 1867, Prince Edward Island. iv. JAMES E.R. PROFIT, b. 1869. 10. MARGARET6 PROFIT (WILLIAM HALL5, WILLIAM4, WILLIAM3, JOHN2, UNKNOWN1) was born 1843 in Prince Edward Island. She married ALEXANDER COUSINS. He was born 1834 in Prince Edward Island. i. CATHRINE7 COUSINS, b. 1865, Prince Edward Island; d. USA. ii. MARY AMELIA COUSINS, b. 1866, Prince Edward Island; m. PETER WARREN. 36. iii. ALEXANDER "ALEX" COUSINS, b. 1868, Prince Edward Island. 37. iv. WILLIAM HALL COUSINS, b. 1870, Prince Edward Island. 38. v. LILLEY ANN COUSINS, b. 1874, Prince Edward Island. 11. ELIZABETH6 PROFIT (WILLIAM HALL5, WILLIAM4, WILLIAM3, JOHN2, UNKNOWN1) was born March 11, 1844. She married WILLIAM MACKAY. 12. MARY ANN6 PROFIT (JOHN5, WILLIAM4, WILLIAM3, JOHN2, UNKNOWN1) was born October 20, 1832 in Prince Edward Island, and died February 22, 1920 in Prince Edward Island. She married DAVID CAMPBELL December 10, 1856 in Prince Edward Island, son of ARCHIBALD CAMPBELL and CHARITY URQUHART. He was born March 23, 1823 in Park Corner, Prince, Prince Edward Island, and died September 03, 1902 in Prince Edward Island. 39. i. ISABELLA7 CAMPBELL, b. November 26, 1857, Irishtown, Prince Edward Island; d. 1899. 40. ii. JAMES CAMPBELL, b. Bef. 1859.
iii. WALTER CAMPBELL, b. Bef. 1859.
iv. DONALD MORRISON CAMPBELL, b. Bef. 1859. 41. v. JOHN CAMPBELL, b. January 11, 1860, Irishtown, Prince Edward Island; d. February 1949. 42. vi. CHRISTY ANN MONTGOMERY CAMPBELL, b. April 20, 1862, Prince Edward Island; d. October 15, 1913, Spring Valley, Prince Edward Island. vii. JAMES EDWARD CAMPBELL, b. December 03, 1867, Irishtown, Prince Edward Island; d. January 24, 1926, Irishtown, Prince Edward Island; m. MARGARET JANE (MAGGIE) BERNARD; b. November 04, 1873, Long River, Prince Edward Island; d. December 23, 1952, Irishtown, Prince Edward Island. viii. EMMA MARIA CAMPBELL, b. Bef. 1871, Springbrook, Queens, Prince Edward Island. ix. ROBERT BRUCE CAMPBELL, b. August 1871, Fermoy, Prince, Prince Edward Island; d. October 30, 1875.
x. WILLIAM PROFITT CAMPBELL, b. February 04, 1873, Irishtown, Prince Edward Island; d. March 22, 1876, Irishtown, Prince Edward Island. 13. WILLIAM6 PROFIT (JOHN5, WILLIAM4, WILLIAM3, JOHN2, UNKNOWN1) was born 1835. He married MARGARET BORTHWICK. She was born January 27, 1836 in New Annan. 43. i. DAVID7 PROFIT, b. October 30, 1858. 44. ii. JONANNA PROFIT, b. October 26, 1860; d. 1943. 45. iii. GEORGE PROFIT, b. November 02, 1862; d. 1942. 46. iv. JOHN PROFIT, b. November 16, 1865.
v. EMMELINE PROFIT, b. July 28, 1868; d. 1868. 47. vi. MARGARET PROFIT, b. July 02, 1870. 48. vii. MARY (FANNIE) PROFIT, b. November 03, 1872. 49. viii. WILLIAM PROFIT, b. August 1875; d. April 24, 1928.
ix. JAMES PROFIT, b. January 02, 1877; m. GRACE WARREN. 14. ISABELLA6 PROFIT (JOHN5, WILLIAM4, WILLIAM3, JOHN2, UNKNOWN1) was born December 1836 in Irishtown, Prince Edward Island. She married WILLIAM PROFIT EVANS, son of WILLIAM EVANS and MARGARET MACKAY. He was born September 08, 1830 in Irishtown, Prince Edward Island, and died December 30, 1895 in Irishtown, Prince Edward Island. 50. i. WILLIAM JOHN7 EVANS, b. 1858, Prince Edward Island; d. 1917. 51. ii. ARCHIBALD NELSON EVANS, b. 1859, Prince Edward Island; d. 1912. 52. iii. ISABELLA "LUCIE ANN" EVANS, b. 1861, Prince Edward Island. 53. iv. ELI JAMES EVANS, b. 1863, Prince Edward Island; d. 1909. 15. RICHARD6 PROFIT (JOHN5, WILLIAM4, WILLIAM3, JOHN2, UNKNOWN1) was born December 27, 1838 in Irishtown, Prince Edward Island. He married THERESA MACKIE. 57. iv. JANE PROFIT, b. 1868, Spring Valley, Prince Edward Island; d. September 26, 1920, Kensington, Prince Edward Island. 58. v. ANNIE PROFIT, b. 1869. 59. vi. JOHN NELSON PROFIT, b. 1870.
vii. CHARLOTTE ISABELLA PROFIT, b. 1872; d. 1880. 16. JOHN HALL6 PROFIT (JOHN5, WILLIAM4, WILLIAM3, JOHN2, UNKNOWN1) was born October 19, 1841 in Irishtown, Prince Edward Island, and died 1908 in Natick, Mass. He married (1) FRANCES SHEEN 1868. She was born 1841 in Prince Edward Island, and died 1893. He married (2) AGNES CHAMPION Aft. 1881, daughter of JOHN CHAMPION and MARY MURPHY. She was born 1844, and died 1924. 60. i. WILLIAM EDWARD7 PROFIT, b. 1869, Irishtown, Prince Edward Island; d. 1943. 61. ii. MARY ANN ELIZABETH PROFIT, b. 1872, Prince Edward Island. 62. iii. BRIDGIT JEAN PROFIT, b. 1876, Prince Edward Island. iv. THERSA FRANCES MAE PROFIT, b. 1882; d. 1956. 17. MARIAH6 PROFIT (JOHN5, WILLIAM4, WILLIAM3, JOHN2, UNKNOWN1) was born June 29, 1844. She married JAMES EVANS, son of WILLIAM EVANS and MARGARET MACKAY. He was born December 01, 1838 in Irishtown, Prince Edward Island, and died January 14, 1903 in Irishtown, Prince Edward Island. 63. ii. JOHN NATHANIEL EVANS, b. 1868. 64. iii. MARIAH EVANS, b. 1875. 18. ISABELLA6 PROFIT (GEORGE5, WILLIAM4, WILLIAM3, JOHN2, UNKNOWN1) was born January 14, 1840 in Prince Edward Island, and died 1915. She married CHARLES HARDY January 30, 1867 in Kildare, Prince Edward Island, son of SOLOMON HARDY and HELEN MACNEILL. He was born 1838 in Scotland, and died 1920.
ii. PARMENAS FRED HARDY, b. July 30, 1867; d. March 23, 1901; m. ABBIE C. MOSHER, September 10, 1898, Worcester, Mass. iii. WILLIAM JAMES HARDY, b. March 06, 1869; d. February 01, 1956; m. EMMA ANN STUBBS, June 26, 1895; b. 1876; d. September 20, 1952.
iv. ROBERT DYER HARDY, b. January 29, 1871, Prince Edward Island; d. March 11, 1952; m. PEARL ESTHER STARBARD, September 20, 1898, Worcester, Mass; b. December 18, 1878, Springfield, Mass; d. September 27, 1965.
v. MARY ELLEN HARDY, b. January 14, 1873, Prince Edward Island; d. December 14, 1958; m. CURTIS LEVI MACRAE, September 10, 1895; b. September 27, 1871; d. July 17, 1946.
vi. GEORGE ALBERT HARDY, b. June 19, 1875, Prince Edward Island; d. March 22, 1904, Kenemish, Labrador, Canada. vii. CHARLES SOLOMON HARDY, b. March 15, 1879, Prince Edward Island; d. March 06, 1963; m. DORA L. FRIER; b. August 05, 1884, Franklin Centre, Quebec; d. April 15, 1962.
viii. INEZ MATILDA HARDY, b. June 30, 1881, Prince Edward Island; d. March 19, 1883.
ix. JOHN ALLEN HARDY, b. September 02, 1883, Prince Edward Island; d. January 19, 1969; m. MABEL CARRIE HAMMIL; b. December 11, 1894; d. June 29, 1981. 19. BARBARA6 PROFIT (GEORGE5, WILLIAM4, WILLIAM3, JOHN2, UNKNOWN1) was born December 15, 1841 in Lot 20, Prince Edward Island, and died March 07, 1894. She married WILLIAM SHARP LARKIN July 01, 1867. He was born 1843, and died 1922.
i. WILLIAM HAMILTON7 LARKIN, b. 1868; d. 1919.
ii. ALEXANDER FRANCIS LARKIN, b. 1870; d. 1955; m. ELIZABETH HUDSON, 1904; d. 1959.
iii. CHRISTIANA LARKIN, b. 1872; d. 1958, Massachusetts, USA; m. ALBERT E. FORSYTH; b. 1866; d. 1928.
iv. MARY FLORA LARKIN, b. 1873; d. September 29, 1895; m. WILLIAM HUNTER, 1893.
v. HERBERT JAMES LARKIN, b. 1876; d. 1937; m. MINNIE TEED, Abt. 1902, Nova Scotia, Canada. vi. ADELINE ISABELLA LARKIN, b. 1877; d. September 27, 1880.
vii. GEORGE WELLINGTON LARKIN, b. 1879; d. 1963, Prince Rupert, British Columbia. viii. ROBERT ARTHUR LARKIN, b. 1881; d. 1964; m. MARGARET CONNOR. ix. BARBARA ELLEN LARKIN, b. 1883; d. 1972, Boston, Massachusetts; m. CHESTER A. PARTRIDGE, 1919. 20. WILLIAM6 PROFIT (GEORGE5, WILLIAM4, WILLIAM3, JOHN2, UNKNOWN1) was born April 11, 1844 in Prince Edward Island. He married SUSAN. She was born Abt. 1854 in Prince Edward Island. i. MARY ESTHER7 PROFIT, b. Abt. 1872, Prince Edward Island. ii. GEORGE ALFRED PROFIT, b. November 01, 1873, Alberton, Prince Edward Island; d. March 27, 1948, Prince Edward Island; m. PERMILLIA CATHERINE CROZIER; b. January 04, 1876, Malpeque, Prince Edward Island; d. June 25, 1947, Darnley, Prince, Prince Edward Island. iii. MARIA M. PROFIT, b. Abt. 1876, Prince Edward Island. iv. LORETTA S. PROFIT, b. Abt. 1880, Prince Edward Island. v. DAVID W. PROFIT, b. Abt. 1881, Prince Edward Island. vi. WILLIAM B PROFIT, b. Abt. 1883, Prince Edward Island. vii. JAMES M. PROFIT, b. Abt. 1883, Prince Edward Island. 21. JOHN THOMAS6 PROFIT (GEORGE5, WILLIAM4, WILLIAM3, JOHN2, UNKNOWN1) was born July 18, 1846 in Prince Edward Island, and died September 23, 1931 in Prince Edward Island. He married MARY ELLEN SMITH. She was born 1854 in Prince Edward Island, and died 1918 in Prince Edward Island. i. BENJAMIN ARTHUR7 PROFIT, b. June 1873, Prince Edward Island; d. November 21, 1952, Prince Edward Island. ii. GEORGE HIRAM PROFIT, b. March 1875, Prince Edward Island; d. February 25, 1951, Prince Edward Island. iii. ELVA HOPE PROFIT, b. 1877, Prince Edward Island; d. 1956; m. WILLIAM HUNTER, 1898.
iv. CHARLES RAY PROFIT, b. April 22, 1887, Prince Edward Island; d. September 12, 1964, Prince Edward Island; m. ANNE IRELAND DUNN; b. September 07, 1887. 22. JAMES HALL6 PROFIT (GEORGE5, WILLIAM4, WILLIAM3, JOHN2, UNKNOWN1) was born January 12, 1853. He married MINNIE CROZIER. i. LOIS7 PROFIT, b. 1878, Prince Edward Island. 23. MARY ANN6 PROFIT (GEORGE5, WILLIAM4, WILLIAM3, JOHN2, UNKNOWN1) was born May 31, 1856. She married WILLIAM MACINTOSH. vi. GEORGE MACINTOSH, b. 1878; d. 1878.
vii. MARY MACINTOSH, b. November 18, 1885, Prince Edward Island; m. AUSTIN FREEMAN STAPLES, May 11, 1914, Gardner, Worcester, Mass; b. December 15, 1882, Lowell, Middlesex, Mass; d. June 16, 1978, Dothen, Alabama. 24. DAVID6 PROFIT (GEORGE5, WILLIAM4, WILLIAM3, JOHN2, UNKNOWN1) was born March 02, 1859 in Tignish, Prince Edward Island, and died December 04, 1946 in Providence, RI. He married LAURA MACARTHUR June 04, 1884 in Alberton, Prince Edward Island, daughter of EDWARD MACARTHUR and JANE HENDERSON. She was born November 09, 1862 in Dock, Lot 4, West Prince County, Prince Edward Island, and died August 06, 1946 in Worcester, MA. 65. i. JEAN7 PROFIT, b. March 31, 1885; d. July 11, 1964.
ii. ROY FREDRICK PROFIT, b. September 11, 1886, Prince Edward Island; d. October 07, 1889, Prince Edward Island. 66. iii. FREDRICK R PROFIT, b. November 05, 1891, Prince Edward Island; d. May 20, 1970, Worcester, MA. 67. iv. FLORENCE PROFIT, b. November 27, 1899, Worcester, MA; d. March 17, 1988, Providence, RI. 68. v. EVERETT PROFIT, b. December 08, 1901; d. August 17, 1978. 69. vi. INEZ PROFIT, b. September 01, 1905; d. September 28, 1996. 25. WILLIAM6 PROFIT (JAMES REGINALD5, WILLIAM4, WILLIAM3, JOHN2, UNKNOWN1) was born April 08, 1840 in New London, Prince Edward Island, and died March 04, 1904 in Woodvale, Prince Edward Island. He married MARY ANN MCGRATH September 23, 1863, daughter of EDWIN MCGRATH and JOHANNA POWER. She was born 1841 in Ireland, and died August 28, 1922 in Woodvale, Prince Edward Island. 70. i. JAMES HALL7 PROFIT, b. September 19, 1864, Nail Pond, Prince Edward Island; d. September 1931, Worcester, Ma. 71. ii. JOHANNA THERESA PROFIT, b. October 13, 1866, Nail Pond, Prince Edward Island; d. June 30, 1906, Alberton, Prince Edward Island. 72. iii. MARY ELIZA PROFIT, b. November 07, 1868, Woodvale, Prince Edward Island; d. March 18, 1924.
iv. MARGARET ANN PROFIT, b. November 11, 1870, Nail Pond, Prince Edward Island; d. November 23, 1937, Kildare, Prince Edward Island; m. PETER GIBBS, August 26, 1911; b. March 17, 1870, Kildare, Prince Edward Island; d. October 26, 1953.
v. CATHERINE ISABELLA PROFIT, b. November 25, 1872, Nail Pond, Prince Edward Island; d. November 24, 1875, Nail Pond, Prince Edward Island. vi. ELLEN ELIZABETH PROFIT, b. November 21, 1874, Nail Pond, Prince Edward Island; d. Bef. 1881, Nail Pond, Prince Edward Island. 73. vii. WINIFRED MARY PROFIT, b. May 25, 1878, Tignish, Prince Edward Island; d. March 13, 1925, Tignish, Prince Edward Island. 74. viii. WILLIAM EDWARD PROFIT, b. February 08, 1881, Woodvale, Prince Edward Island; d. January 27, 1937, Woodvale, Prince Edward Island. ix. FRANCES ANN PROFIT, b. July 24, 1883, Woodvale, Prince Edward Island; d. August 19, 1884, Woodvale, Prince Edward Island. x. EMILY GERTRUDE PROFIT, b. May 27, 1884, Woodvale, Prince Edward Island; d. 1885, Woodvale, Prince Edward Island. xi. SARAH EMILY PROFIT, b. June 07, 1885, Woodvale, Prince Edward Island; d. June 1888, Woodvale, Prince Edward Island. 26. JAMES HALL6 PROFIT (JAMES REGINALD5, WILLIAM4, WILLIAM3, JOHN2, UNKNOWN1) was born December 20, 1841, and died August 1903. He married MARIETTA ROGERS Abt. 1870. 75. i. ISABELLA7 PROFIT, b. 1871, New York, USA; d. 1939. 76. ii. GRACE PROFIT, b. 1874, New York, USA; d. 1963. 77. iii. RUTHERFORD JAMES PROFIT, b. May 05, 1876, New York, USA; d. 1925. 27. JOHN6 PROFIT (JAMES REGINALD5, WILLIAM4, WILLIAM3, JOHN2, UNKNOWN1) was born 1844 in Prince Edward Island, and died Abt. 1916 in Notick, Mass. He married MARTHA ANN COUGHLIN August 05, 1874 in at John's residence in Montrose, PEI. She was born 1855 in Prince Edward Island. i. GUERNEY7 PROFIT, d. USA. 79. iii. ISABELLA PROFIT, b. October 07, 1875; d. 1936.
iv. ELIZA ANN PROFIT, b. 1877; d. February 1887.
v. JAMES ALLEN PROFIT, b. 1880.
vi. GEORGE HERBER PROFIT, b. 1882.
vii. ELIZABETH GLENN PROFIT, b. 1884; d. 1900, USA. viii. WILLIAM NELSON PROFIT, b. 1887, USA; m. IRENE, 1929. 80. ix. MARGARET PROFIT, b. 1895, USA; d. Bef. 1928, USA. 28. DUNCAN6 PROFIT (JAMES REGINALD5, WILLIAM4, WILLIAM3, JOHN2, UNKNOWN1) was born February 27, 1845 in Irishtown, Prince Edward Island, and died 1904 in Bloomfield, Prince Edward Island. He married ELIZABETH METHERAL. She died May 16, 1932.
i. BEATRICE7 PROFIT, b. 1876, Bloomfield, Prince Edward Island; d. 1932, Rosebank, Prince Edward Island. 81. ii. LESTER EDGERTON PROFIT, b. February 19, 1878, Bloomfield, Prince Edward Island; d. March 09, 1962, Rosebank, Prince Edward Island. 82. iii. ELIZABETH PROFIT, b. 1881, Bloomfield, Prince Edward Island; d. 1944, O'Leary, Prince Edward Island. iv. MAMIE PROFIT, b. 1887; d. 1923. 29. ISABELLA6 PROFIT (JAMES REGINALD5, WILLIAM4, WILLIAM3, JOHN2, UNKNOWN1) was born March 22, 1850 in New London, Prince Edward Island, and died in Worcester, Ma. She married JOHN GREY October 14, 1889. He was born 1837, and died 1913.
i. WILLIAM DAVID7 GREY, b. August 02, 1890, Coleman, Prince Edward Island; d. 1914.
ii. JOHN THOMAS GREY, b. December 01, 1891, Coleman, Prince Edward Island; d. Worcester, Ma. iii. ELIZABETH (BESSIE) RAYWORTH GREY, b. March 30, 1894, Coleman, Prince Edward Island; d. USA; m. RALPH HAYWOOD. 30. BENJAMIN BEARISTRO6 PROFIT (JAMES REGINALD5, WILLIAM4, WILLIAM3, JOHN2, UNKNOWN1) was born September 14, 1860 in Fernroy, Prince Edward Island, and died 1911 in Augustine Cove, Prince Edward Island. He married SARAH JANE ROSS May 26, 1882 in Presbyterian Manse, Alberton, Prince Edward Island, daughter of DONALD ROSS and EUPHEMIA CAMPBELL. She was born January 01, 1864 in Alberton, Prince Edward Island, and died April 04, 1925 in Middletown, Prince Edward Island. 83. i. ELIZA ADELAIDE7 PROFIT, b. February 03, 1883, Augustine Cove, Prince Edward Island; d. March 06, 1928. 84. ii. JAMES REGINALD PROFIT, b. March 11, 1884, Augustine Cove, Prince Edward Island; d. November 01, 1962, Fall City, Washington. iii. GEORGE DANIEL PROFIT, b. March 21, 1886, Augustine Cove, Prince Edward Island; d. British Columbia. iv. EVERETT KING PROFIT, b. June 28, 1892, Augustine Cove, Prince Edward Island; d. August 28, 1977, Rochester, MI; m. VONIA WYMAN LAWRY, October 13, 1917, Lewiston, ME; b. October 22, 1895; d. January 11, 1986.
v. HERBER KEITH PROFIT, b. June 28, 1892, Augustine Cove, Prince Edward Island; d. 1960; m. LOTTIE MACDONALD; b. 1889; d. 1981. 85. vi. EUPHEMIA JANE PROFIT, b. March 25, 1894, Augustine Cove, Prince Edward Island; d. Maine, USA. vii. ALBERTA "BERTHA" BELLE PROFIT, b. June 16, 1899, Augustine Cove, Prince Edward Island; d. October 05, 1976, Ottawa, Ontario; m. ALBERT DIXON. 31. WILLIAM HALL (YOUNG QUAKER)7 CAMPBELL (ANNA MYRIAH (MARIA)6 PROFIT, WILLIAM HALL5, WILLIAM4, WILLIAM3, JOHN2, UNKNOWN1) was born November 09, 1855 in Irishtown, Prince Edward Island, and died March 05, 1919. He married PRISCILLA ELLEN COUSINS October 10, 1879. She was born August 01, 1857 in Prince Edward Island, and died September 30, 1948.
i. ALEXANDER8 CAMPBELL, m. MARGARET MILLMAN. ii. OLIVER CAMPBELL, m. ALENE BOWNESS. iii. EMELINE CAMPBELL, m. JAMES ANDREW CAMPBELL; b. June 02, 1879, Irishtown, Prince Edward Island; d. 1953.
iv. EILEEN CAMPBELL, m. (1) JAMES CAMPBELL; m. (2) WILLIAM WILLIAMS. v. ANNE CAMPBELL, m. WILL WILLIAMS. vi. MARGARET CAMPBELL, m. WILLIAM KERR. viii. EDITH CAMPBELL, m. ANSEL BENARD. 32. ALEXANDER7 CAMPBELL (ANNA MYRIAH (MARIA)6 PROFIT, WILLIAM HALL5, WILLIAM4, WILLIAM3, JOHN2, UNKNOWN1) was born January 06, 1858 in Irishtown, Prince Edward Island, and died March 29, 1906. He married JONIA FANNING (FANNIE) MACLEAN. She was born March 05, 1865 in Prince Edward Island, and died January 24, 1928.
i. RUTH8 CAMPBELL, m. FRANK SPARROW. ii. LOIS CAMPBELL, d. 1921.
iii. MARION CAMPBELL, m. CARL WEEKS. iv. WILFRED CAMPBELL, m. SADIE MACNEILL. v. GLEN(A??) CAMPBELL, m. EDDIE MURPHY. vi. HELEN CAMPBELL, m. HAYDEN NIXON. vii. NORRIS CAMPBELL, m. GWEN HAFFEN. viii. ERMA CAMPBELL, m. ALBERT CARSIA. ix. LOUIS CAMPBELL, m. PATRICK LEROY. 33. JOHN ARCHIBALD7 CAMPBELL (ANNA MYRIAH (MARIA)6 PROFIT, WILLIAM HALL5, WILLIAM4, WILLIAM3, JOHN2, UNKNOWN1) was born September 09, 1864 in Irishtown, Prince Edward Island, and died 1946. He married BARBARA BERNARD. She was born April 11, 1877 in Long River, Prince Edward Island, and died July 1938.
i. GRACE8 CAMPBELL, m. ALONZO HOLMES. 34. MARY RAMSAY7 CAMPBELL (ANNA MYRIAH (MARIA)6 PROFIT, WILLIAM HALL5, WILLIAM4, WILLIAM3, JOHN2, UNKNOWN1) was born August 04, 1871 in Irishtown, Prince Edward Island, and died 1945. She married WILLIAM KEIR BERNARD. He was born November 02, 1870 in Long River, Prince Edward Island, and died October 20, 1946.
i. LAURA8 BERNARD, m. EDWARD CAMPBELL. ii. ELVA BERNARD, m. HERBERT MACKAY. 35. JAMES ANDREW7 CAMPBELL (ANNA MYRIAH (MARIA)6 PROFIT, WILLIAM HALL5, WILLIAM4, WILLIAM3, JOHN2, UNKNOWN1) was born June 02, 1879 in Irishtown, Prince Edward Island, and died 1953. He married (1) W. SADIE LARAHILLE PIDDINGTON. She was born Abt. 1876 in Boston, Massachusetts, and died 1937. He married (2) EMELINE CAMPBELL, daughter of WILLIAM CAMPBELL and PRISCILLA COUSINS. i. GRACE8 CAMPBELL, m. ROBERT CARSELL. ii. ALTA CAMPBELL, m. JACK INGLIS. iii. EILEEN CAMPBELL, m. REGINALD LANDRY. iv. LULA CAMPBELL, m. HERBERT BUCHANAN. 36. ALEXANDER "ALEX"7 COUSINS (MARGARET6 PROFIT, WILLIAM HALL5, WILLIAM4, WILLIAM3, JOHN2, UNKNOWN1) was born 1868 in Prince Edward Island. He married ANNIE CROZIER. i. VERNA8 COUSINS, m. ROY MACARTHUR. ii. JESSIE COUSINS, m. ROBERT HOGG. iii. RUBY COUSINS, m. JOHN MARCHBANK. 37. WILLIAM HALL7 COUSINS (MARGARET6 PROFIT, WILLIAM HALL5, WILLIAM4, WILLIAM3, JOHN2, UNKNOWN1) was born 1870 in Prince Edward Island. He married FLORENCE PAYNTER. i. EVERETT8 COUSINS, m. EVELYN DONALD. 38. LILLEY ANN7 COUSINS (MARGARET6 PROFIT, WILLIAM HALL5, WILLIAM4, WILLIAM3, JOHN2, UNKNOWN1) was born 1874 in Prince Edward Island. She married HERB RAMSEY. i. MARGARET JANE8 RAMSEY, b. Link to Lillie Ann Cousins; m. ARTHUR MACKAY. 39. ISABELLA7 CAMPBELL (MARY ANN6 PROFIT, JOHN5, WILLIAM4, WILLIAM3, JOHN2, UNKNOWN1) was born November 26, 1857 in Irishtown, Prince Edward Island, and died 1899. She married ALEXANDER MACGOUGAN. He was born March 20, 1858 in Malpeque, Prince Edward Island, and died 1937 in Malpeque, Prince Edward Island. 40. JAMES7 CAMPBELL (MARY ANN6 PROFIT, JOHN5, WILLIAM4, WILLIAM3, JOHN2, UNKNOWN1) was born Bef. 1859. He married MARGARET BERNARD. i. GARNET8 CAMPBELL, m. LULU MONGOMERY. ii. MINETTA CAMPBELL, m. JOHN CAMERON. iii. CHRISTIE CAMPBELL, m. KEN CHAMPION. iv. LESILE CAMPBELL, m. MARY HARDING. v. ETHEL CAMPBELL, m. ELWOOD CHAMPION. vi. KATIE CAMPBELL, m. GEORGE MACKINNON. vii. LEITA CAMPBELL, m. OLIVER MACLEOD. viii. LORNE CAMPBELL, m. HATTIE WALL. ix. EDWIN CAMPBELL, m. SADIN LAUGLIN. x. RUTH CAMPBELL, m. CHESTER MACKAY. 41. JOHN7 CAMPBELL (MARY ANN6 PROFIT, JOHN5, WILLIAM4, WILLIAM3, JOHN2, UNKNOWN1) was born January 11, 1860 in Irishtown, Prince Edward Island, and died February 1949. He married LOUISA GRACE TUPLIN. She was born January 02, 1863 in Indian River, Prince Edward Island, and died December 22, 1940.
i. ANNIE8 CAMPBELL, m. DAVID CLARK. ii. PRESTON CAMPBELL, m. ETTA ARTHUR. iii. LYDIA CAMPBELL, m. GEORGE MACNEIL. iv. JOHN CAMPBELL, m. GLADYS GREENWOOD DAMSKIN. 42. CHRISTY ANN MONTGOMERY7 CAMPBELL (MARY ANN6 PROFIT, JOHN5, WILLIAM4, WILLIAM3, JOHN2, UNKNOWN1) was born April 20, 1862 in Prince Edward Island, and died October 15, 1913 in Spring Valley, Prince Edward Island. She married WILLIAM HENRY CASELEY Abt. 1894. He was born August 14, 1863 in Spring Valley, Prince Edward Island, and died 1937 in Spring Valley, Prince Edward Island. ii. ANNIE CASELEY, m. HIRAM HARRINGTON. 43. DAVID7 PROFIT (WILLIAM6, JOHN5, WILLIAM4, WILLIAM3, JOHN2, UNKNOWN1) was born October 30, 1858. He married EMMA DOUGHART. i. WILLIAM DOUGHART8 PROFIT, m. MARY HAZEL MACMURDO. ii. DOUGLAS PROFIT, m. MAMIE SHEEN. iv. MARY PROFIT, m. HAROLD WOODSIDE. 44. 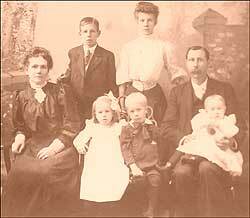 JONANNA7 PROFIT (WILLIAM6, JOHN5, WILLIAM4, WILLIAM3, JOHN2, UNKNOWN1) was born October 26, 1860, and died 1943. She married ANDREW MACLEOD. He was born 1855, and died 1951.
ii. WILLIAM MACLEOD, m. MARGARET BROWN. iii. HEATH MACLEOD, m. ELIXABETH COUSINS. 45. GEORGE7 PROFIT (WILLIAM6, JOHN5, WILLIAM4, WILLIAM3, JOHN2, UNKNOWN1) was born November 02, 1862, and died 1942. He married ANNETTE (NETTIE) JANE TUPLIN. She was born 1863, and died 1948.
i. HERBERT REED8 PROFIT, b. 1888; d. 1953; m. JESSIE ROGERS. ii. WILLIAM JOHN "JACK" PROFIT, b. 1890; m. FANNIE MOASE, Aft. 1919.
iii. EDITH PROFIT, b. 1894; d. 1980; m. HARRY BOWNESS; b. 1888; d. 1978.
iv. GEORGE ELLIS PROFIT, b. 1896; m. LILLY CASELEY, 1922.
v. HARRY PROFIT, b. 1899.
vi. DAVID "DAVE" WINFIELD PROFIT, b. 1903; m. EVELYN TAYLOR. 46. JOHN7 PROFIT (WILLIAM6, JOHN5, WILLIAM4, WILLIAM3, JOHN2, UNKNOWN1) was born November 16, 1865. He married CARRIE THOMPSON. 47. MARGARET7 PROFIT (WILLIAM6, JOHN5, WILLIAM4, WILLIAM3, JOHN2, UNKNOWN1) was born July 02, 1870. She married CHESTER TUPLIN. 48. MARY (FANNIE)7 PROFIT (WILLIAM6, JOHN5, WILLIAM4, WILLIAM3, JOHN2, UNKNOWN1) was born November 03, 1872. She married HIRAM THOMPSON. vi. STANLEY THOMPSON, m. KATHERINE CASELEY. 49. WILLIAM7 PROFIT (WILLIAM6, JOHN5, WILLIAM4, WILLIAM3, JOHN2, UNKNOWN1) was born August 1875, and died April 24, 1928. He married MARY ELIZABETH MILLMAN June 26, 1901, daughter of JOHN MILLMAN and JESSIE MACLEOD. She was born December 1878, and died July 28, 1966.
i. WILLIAM JOHN8 PROFIT, b. May 19, 1902; d. 1978; m. (1) VELDA DUNNING; m. (2) SOPHIA SIMPSON; b. September 01, 1901; d. December 07, 1970; m. (3) GERTIE. ii. OLIVER EDISON PROFIT, b. January 04, 1904; d. 1984; m. MARGARET CHAMPION, February 1928; b. January 26, 1904; d. May 03, 1983.
iii. WALTER HARLAND PROFIT, b. January 04, 1904; d. July 14, 1904.
iv. HALSEY BORTHWICK PROFIT, b. September 16, 1906; d. March 12, 1988; m. CHARLOTTE ELSIE BERNARD, July 18, 1928; d. November 11, 1976.
v. RUBY CRETA PROFIT, b. June 01, 1908; m. JAMES ALVIN BERNARD, September 14, 1938.
vi. HERBERT MACLEOD PROFIT, b. November 10, 1910; m. ELLA MAUD MOASE, October 28, 1936.
vii. JESSIE KATHLEAN PROFIT, b. September 20, 1912; m. (1) DES JACK JASON KEMP, September 20, 1941; m. (2) LEAFORD BOWES, December 19, 1971.
viii. JAMES ANDREW PROFIT, b. August 30, 1915; d. October 04, 1917.
ix. GLADYS MYRTLE PROFIT, b. October 20, 1917; m. ROBERT EDMOND STEVART, December 01, 1937.
x. ARTHUR ROBERT PROFIT, b. August 12, 1919; m. ELVA LAUANIA PICKERING, December 04, 1940.
xi. ERNEST ROLAND PROFIT, b. March 10, 1924; m. ERMA PARKIN, July 15, 1960. 50. WILLIAM JOHN7 EVANS (ISABELLA6 PROFIT, JOHN5, WILLIAM4, WILLIAM3, JOHN2, UNKNOWN1) was born 1858 in Prince Edward Island, and died 1917. He married MARY AMELIA BERNARD. 51. ARCHIBALD NELSON7 EVANS (ISABELLA6 PROFIT, JOHN5, WILLIAM4, WILLIAM3, JOHN2, UNKNOWN1) was born 1859 in Prince Edward Island, and died 1912. He married ELIZABETH JANE MILLMAN. 52. ISABELLA "LUCIE ANN"7 EVANS (ISABELLA6 PROFIT, JOHN5, WILLIAM4, WILLIAM3, JOHN2, UNKNOWN1) was born 1861 in Prince Edward Island. She married EDWIN PAYNTER. He was born 1854, and died 1935. 53. ELI JAMES7 EVANS (ISABELLA6 PROFIT, JOHN5, WILLIAM4, WILLIAM3, JOHN2, UNKNOWN1) was born 1863 in Prince Edward Island, and died 1909. He married VIRGINIA RILEY. ii. EVA EVANS, m. WALTER WAITA. iii. LUCY EVANS, b. 1882; d. 1909. 54. GARNET7 PROFIT (RICHARD6, JOHN5, WILLIAM4, WILLIAM3, JOHN2, UNKNOWN1) He married MARY ANN MACLEOD. 55. JAMES7 PROFIT (RICHARD6, JOHN5, WILLIAM4, WILLIAM3, JOHN2, UNKNOWN1) He married HELENA FLORENCE INMAN. 56. AMELIA7 PROFIT (RICHARD6, JOHN5, WILLIAM4, WILLIAM3, JOHN2, UNKNOWN1) She married CHELMSFORD MACLEOD. 57. JANE7 PROFIT (RICHARD6, JOHN5, WILLIAM4, WILLIAM3, JOHN2, UNKNOWN1) was born 1868 in Spring Valley, Prince Edward Island, and died September 26, 1920 in Kensington, Prince Edward Island. She married WILLIAM GEORGE SIMPSON November 20, 1895 in Prince Edward Island. He was born January 20, 1869, and died July 13, 1942 in Kensington, Prince Edward Island. ii. ANNIE FLORENCE "FLORRIE" SIMPSON, b. October 09, 1897; d. August 13, 1981; m. ERNEST TALMAGE MILL; b. November 17, 1895; d. February 08, 1984.
iii. JENNIE VESTA SIMPSON, b. April 03, 1903; m. ROBERT SCOT HUMPHREY, January 30, 1924; b. April 25, 1903.
iv. ELLA BELLE SIMPSON, b. August 08, 1908; m. VAUGHAN GROOM; b. January 06, 1909. 58. ANNIE7 PROFIT (RICHARD6, JOHN5, WILLIAM4, WILLIAM3, JOHN2, UNKNOWN1) was born 1869. She married PAUL THOMPSON. i. MAMIE8 THOMPSON, m. RUSSELL MACKAY. ii. THERESA THOMPSON, m. CECIL MILL. 59. JOHN NELSON7 PROFIT (RICHARD6, JOHN5, WILLIAM4, WILLIAM3, JOHN2, UNKNOWN1) was born 1870. He married MAUDE BERNARD. 60. WILLIAM EDWARD7 PROFIT (JOHN HALL6, JOHN5, WILLIAM4, WILLIAM3, JOHN2, UNKNOWN1) was born 1869 in Irishtown, Prince Edward Island, and died 1943. He married LAURA MACLEOD. She was born 1876, and died 1901.
ii. BESSIE DELL PROFIT, b. 1894; d. 1972; m. (1) ARTHUR K. STEWART; d. 1918; m. (2) STANLEY SHERITT. iii. EULALIA PROFIT, b. September 1897; d. May 09, 1899.
iv. FRED HAROLD PROFIT, b. 1898; d. 1970.
v. LAURA MYRTLE PROFIT, b. 1900; m. HAROLD PAYNTER. 61. MARY ANN ELIZABETH7 PROFIT (JOHN HALL6, JOHN5, WILLIAM4, WILLIAM3, JOHN2, UNKNOWN1) was born 1872 in Prince Edward Island. She married HERBERT MOASE. 62. BRIDGIT JEAN7 PROFIT (JOHN HALL6, JOHN5, WILLIAM4, WILLIAM3, JOHN2, UNKNOWN1) was born 1876 in Prince Edward Island. She married (1) WILLIAM LESLIE. She married (2) HEATH BOWNESS. 63. JOHN NATHANIEL7 EVANS (MARIAH6 PROFIT, JOHN5, WILLIAM4, WILLIAM3, JOHN2, UNKNOWN1) was born 1868. He married (1) MARY MARGARET SMITH. He married (2) MELVINA MANN. 64. MARIAH7 EVANS (MARIAH6 PROFIT, JOHN5, WILLIAM4, WILLIAM3, JOHN2, UNKNOWN1) was born 1875. He married JOHN MACKAY. i. MILDRED8 EVANS, m. HERBERT BUNTAIN. ii. GEORGE EVANS, m. RUTH MONTGOMERY. iii. JAMES EVANS, m. MARGARET MACMURDO. iv. JENNIE EVANS, m. BRUCE CLARK. 65. JEAN7 PROFIT (DAVID6, GEORGE5, WILLIAM4, WILLIAM3, JOHN2, UNKNOWN1) was born March 31, 1885, and died July 11, 1964. She married WILLIS HARRIMAN December 28, 1912 in Worcester, MA. i. CHARLES DAVID8 HARRIMAN, b. October 1913. 66. FREDRICK R7 PROFIT (DAVID6, GEORGE5, WILLIAM4, WILLIAM3, JOHN2, UNKNOWN1) was born November 05, 1891 in Prince Edward Island, and died May 20, 1970 in Worcester, MA. He married BERTHA M. RIVERS July 01, 1922 in Worcester, MA. i. RICHARD FREDRICK8 PROFIT, b. May 03, 1926; d. May 04, 1926. 67. FLORENCE7 PROFIT (DAVID6, GEORGE5, WILLIAM4, WILLIAM3, JOHN2, UNKNOWN1) was born November 27, 1899 in Worcester, MA, and died March 17, 1988 in Providence, RI. She married FRANK LAWSON SUETTERLEIN August 29, 1925 in Dudley Bible College, Dudley, MA, son of FRANK SUETTERLEIN and SUSAN KIRKPATRICK. He was born June 02, 1902 in Hancock, NY, and died June 18, 1992 in Cranstown, RI. i. VIOLA JEAN8 SUETTERLEIN, b. May 22, 1927, Lewiston, Maine; m. MUNRO CAMPBELL, June 1948, Providence, RI; b. February 22, 1921, Perth, Scotland. ii. DAVID SUETTERLEIN, b. June 08, 1931, Orange, NJ; m. LORRAINE HALL, August 20, 1955, Stowe, Vermont; b. April 10, 1933, Stowe, Vermont. 68. EVERETT7 PROFIT (DAVID6, GEORGE5, WILLIAM4, WILLIAM3, JOHN2, UNKNOWN1) was born December 08, 1901, and died August 17, 1978. He married (1) JAN. He married (2) ALFREDA NOYES August 08, 1931 in Worcester, MA. i. EVERT ROY (CHIP)8 PROFIT, b. June 25, 1942. 69. INEZ7 PROFIT (DAVID6, GEORGE5, WILLIAM4, WILLIAM3, JOHN2, UNKNOWN1) was born September 01, 1905, and died September 28, 1996. She married JAMES CORNELL. i. EDWIN8 CORNELL, b. 1925; m. CAROL. ii. PHYLIS MERYLEND CORNELL, b. September 28, 1928; d. December 1934.
iii. JEAN CORNELL, b. 1943. 70. JAMES HALL7 PROFIT (WILLIAM6, JAMES REGINALD5, WILLIAM4, WILLIAM3, JOHN2, UNKNOWN1) was born September 19, 1864 in Nail Pond, Prince Edward Island, and died September 1931 in Worcester, Ma. He married VICTORIA WADE. She was born 1867 in Tignish, Prince Edward Island, and died 1970.
i. MARY GENIEVE8 PROFIT, b. 1892; d. 1892.
ii. WILLIAM CYRIL PROFIT, b. 1894; d. 1894.
iii. ELMER PROFIT, b. 1896; d. 1918.
iv. EVA PROFIT, b. 1898; d. December 1977; m. WILLIAM PHILLPOT. v. MARGARET ANASTASIA (ANNE) PROFIT, b. 1905; d. 1970; m. JOHN WREN. vi. JOHN WADE PROFIT, b. December 10, 1906; d. December 30, 1951; m. NELLIE. vii. EVELINE PROFIT, b. 1910; m. JOHN LAHAIR; b. 1910; d. 1978. 71. JOHANNA THERESA7 PROFIT (WILLIAM6, JAMES REGINALD5, WILLIAM4, WILLIAM3, JOHN2, UNKNOWN1) was born October 13, 1866 in Nail Pond, Prince Edward Island, and died June 30, 1906 in Alberton, Prince Edward Island. She married FIDELE DESROCHE January 20, 1885. He was born 1855, and died January 18, 1907.
i. MARGUERITE8 DESROCHE, d. March 15, 1974.
ii. WILLIAM DESROCHE, b. 1888; d. June 20, 1929.
iii. EARNEST DESROCHE, b. 1890; d. February 06, 1940.
iv. EDWARD DESROCHE, b. August 24, 1892; d. October 30, 1936; m. EMMA GAUDET. v. PETER (OR CHARLIE) DESROCHE, b. 1906; d. 1906. 72. MARY ELIZA7 PROFIT (WILLIAM6, JAMES REGINALD5, WILLIAM4, WILLIAM3, JOHN2, UNKNOWN1) was born November 07, 1868 in Woodvale, Prince Edward Island, and died March 18, 1924. She married EDWARD HARPER February 17, 1890 in St Simon & St Jude, Tignish, Prince Edward Island, son of JOHN HARPER and MARGARET FITZGERALD. He was born April 07, 1865 in Harper Road, Prince Edward Island, and died October 26, 1953.
i. MARY (MAMIE)8 HARPER, b. March 25, 1890, Tignish, Prince Edward Island; d. September 27, 1968; m. (1) AUSTIN O'MEARA; m. (2) JOHN GAVIN; m. (3) JOHN DOYLE. ii. CHARLES BOROMEO (RONNIE) HARPER, b. November 04, 1891, Tignish, Prince Edward Island; d. April 30, 1926, Tignish, Prince Edward Island; m. ANNIE GAVIN; b. 1895; d. 1957.
iii. LORETTA EMILY HARPER, b. May 04, 1893, Harper Road, Prince Edward Island; d. July 10, 1974, Tignish, Prince Edward Island; m. JOHN GAVIN; b. 1890; d. 1945.
iv. MARGARET GENEVIEVE (EVA) HARPER, b. August 13, 1895, Tignish, Prince Edward Island; d. October 02, 1970, Alberton, Prince Edward Island; m. CHARLES GAVIN. v. JOHN "LOUIS" HARPER, b. July 08, 1897, Tignish, Prince Edward Island; d. November 05, 1984, Tignish, Prince Edward Island; m. ROSE HANDRAHAN. vi. WILLIAM RAYMOND HARPER, b. October 19, 1899, Tignish, Prince Edward Island; d. March 28, 1967, South Grafton, Mass. ; m. WINNIFRED PERRY. vii. MARY REGINA HARPER, b. October 01, 1901; d. 1901.
viii. EDWARD HOWARD HARPER, b. June 28, 1904, Tignish, Prince Edward Island; d. July 26, 1975, Tignish, Prince Edward Island; m. BERNETTA MACINTYRE; b. 1904; d. 1985.
ix. WILLIAM LOUIS HARPER, b. August 16, 1905; d. July 25, 1928. 73. WINIFRED MARY7 PROFIT (WILLIAM6, JAMES REGINALD5, WILLIAM4, WILLIAM3, JOHN2, UNKNOWN1) was born May 25, 1878 in Tignish, Prince Edward Island, and died March 13, 1925 in Tignish, Prince Edward Island. She married PATRICK HARPER February 18, 1901, son of JOHN HARPER and MARGARET FITZGERALD. He was born March 18, 1867 in Tignish, Prince Edward Island, and died July 25, 1961 in Tignish, Prince Edward Island. i. RETA8 HARPER, b. 1901; d. July 13, 1922.
ii. HACKETT HARPER, b. 1903; d. March 06, 1936; m. LILLIAN MACRAE; b. 1909.
iii. EVERETT HARPER, b. 1905; d. 1986.
iv. BERNARD HARPER, b. 1907; d. June 26, 1991; m. DELILIAH ARSENAULT. v. ERNEST HARPER, b. 1909; d. December 23, 1976; m. WINNIFRED PROFIT. 74. WILLIAM EDWARD7 PROFIT (WILLIAM6, JAMES REGINALD5, WILLIAM4, WILLIAM3, JOHN2, UNKNOWN1) was born February 08, 1881 in Woodvale, Prince Edward Island, and died January 27, 1937 in Woodvale, Prince Edward Island. He married BRIDGET GAVIN. She was born December 29, 1883 in Tignish, Prince Edward Island, and died February 20, 1937 in Woodvale, Prince Edward Island. i. WILLIAM EDWARD8 PROFIT, m. CATHERINE WALLACE; b. 1933.
iii. ARGATHA PROFIT, m. TOMMY. iv. WINNIFRED PROFIT, b. 1908; d. 1934.
v. BERNARD PROFIT, b. 1912; d. 1935.
vi. IRENE PROFIT, b. 1913. 75. ISABELLA7 PROFIT (JAMES HALL6, JAMES REGINALD5, WILLIAM4, WILLIAM3, JOHN2, UNKNOWN1) was born 1871 in New York, USA, and died 1939. She married WILLIAM STRYKER. 76. GRACE7 PROFIT (JAMES HALL6, JAMES REGINALD5, WILLIAM4, WILLIAM3, JOHN2, UNKNOWN1) was born 1874 in New York, USA, and died 1963. She married JOSEPH H. RISELEY. He died 1935.
i. JOSEPH8 RISELEY, b. 1894; m. BARBARA MATTHEWS. ii. HANNA MARRIETTA RISELEY, b. 1896; m. GEORGE B. CRAFTS; b. 1886; d. 1947.
iii. JAMES RISELEY, b. 1898; m. (1) CATHERINE HANNE; m. (2) MARY MOSSMAN. iv. RICHARD RISELEY, b. 1907; d. 1937; m. RUTH BURNS. v. GRACE ISABELLA RISELEY, b. 1908; d. 1908. 77. RUTHERFORD JAMES7 PROFIT (JAMES HALL6, JAMES REGINALD5, WILLIAM4, WILLIAM3, JOHN2, UNKNOWN1) was born May 05, 1876 in New York, USA, and died 1925. He married ISABELLA PROFIT, daughter of JOHN PROFIT and MARTHA COUGHLIN. She was born October 07, 1875, and died 1936.
i. MARTHA MARRIETTA8 PROFIT, b. January 01, 1906; m. (1) CHESTER BENJAMIN; m. (2) CLIFFORD CLARK, September 02, 1925; m. (3) WILLIAM LA ROSE, 1937.
ii. JOHN JAMES HALL PROFIT, b. March 07, 1909; d. August 15, 1959; m. HELEN BERBECK. iii. ISABELLA JOYCE PROFIT, b. June 04, 1911; d. April 01, 1991; m. (1) ARTHUR D. PATENAUDE; m. (2) FRANK W. WORTHY. iv. WILLIAM BEAIRSTO PROFIT, b. October 29, 1912; d. 1963; m. MOZELLA PYLES. v. MARGARET GRACE PROFIT, b. December 24, 1916; d. 1962; m. WILLIAM HARTLAND. i. GORDON8 PROFIT, b. Abt. 1957; d. Abt. 1987. 79. ISABELLA7 PROFIT (JOHN6, JAMES REGINALD5, WILLIAM4, WILLIAM3, JOHN2, UNKNOWN1) was born October 07, 1875, and died 1936. She married RUTHERFORD JAMES PROFIT, son of JAMES PROFIT and MARIETTA ROGERS. He was born May 05, 1876 in New York, USA, and died 1925. Children are listed above under (77) Rutherford James Profit. 80. 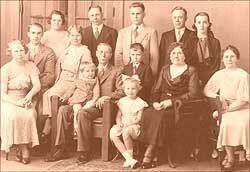 MARGARET7 PROFIT (JOHN6, JAMES REGINALD5, WILLIAM4, WILLIAM3, JOHN2, UNKNOWN1) was born 1895 in USA, and died Bef. 1928 in USA. She married CECIL JAMES BOATES, son of WILLIAM BOATES and SARAH BUCHANAN. He was born April 10, 1896, and died October 22, 1971 in Brookline, Norfolk Co, MA, USA. i. GLEN(A)8 BOATES, m. VINCENT SHEA. 81. LESTER EDGERTON7 PROFIT (DUNCAN6, JAMES REGINALD5, WILLIAM4, WILLIAM3, JOHN2, UNKNOWN1) was born February 19, 1878 in Bloomfield, Prince Edward Island, and died March 09, 1962 in Rosebank, Prince Edward Island. He married MARGARET ETHEL GORDON September 26, 1905 in Cascumpec, Prince Edward Island. She was born December 30, 1877 in Cascumpec, Prince Edward Island, and died October 03, 1960.
i. LEILA JEAN8 PROFIT, m. THOMAS FREDERICK LEARD; b. December 12, 1911, Hills River, Prince Edward Island; d. August 27, 1995, Alberton, Prince Edward Island. ii. HERBERT GORDON PROFIT, b. August 19, 1906; d. 1971; m. VERNA VESSEY. 82. ELIZABETH7 PROFIT (DUNCAN6, JAMES REGINALD5, WILLIAM4, WILLIAM3, JOHN2, UNKNOWN1) was born 1881 in Bloomfield, Prince Edward Island, and died 1944 in O'Leary, Prince Edward Island. She married HENRY STETSON. He was born 1881, and died 1965.
i. ERROL8 STETSON, m. ISABEL RAMSEY. 83. ELIZA ADELAIDE7 PROFIT (BENJAMIN BEARISTRO6, JAMES REGINALD5, WILLIAM4, WILLIAM3, JOHN2, UNKNOWN1) was born February 03, 1883 in Augustine Cove, Prince Edward Island, and died March 06, 1928. She married ELLIS HOFFMAN BRADSHAW. He was born December 17, 1869, and died 1955.
i. SARAH (SADIE) ELIZABETH8 BRADSHAW, b. July 26, 1907.
ii. JESSIE BENJAMIN BRADSHAW, b. November 26, 1908; d. 1987.
iii. JANE (JANIE) BRADSHAW, b. October 06, 1910.
iv. IDA HELENA BRADSHAW, b. January 10, 1913.
v. WINNIFRED BRADSHAW, b. October 15, 1914; d. September 25, 1916.
vi. REGINALD WRIGHT BRADSHAW, b. November 17, 1916; d. October 12, 1991.
vii. COTTIE LEE BRADSHAW, b. July 05, 1918.
viii. MELBOURNE ALLISON BRADSHAW, b. November 13, 1920.
ix. RETA ALBERTA (RUTH) BRADSHAW, b. June 15, 1924.
x. MAE DORIS BRADSHAW, b. July 06, 1925.
xi. ROSS ELLIS BRADSHAW, b. March 01, 1928; d. September 23, 1930. 84. JAMES REGINALD7 PROFIT (BENJAMIN BEARISTRO6, JAMES REGINALD5, WILLIAM4, WILLIAM3, JOHN2, UNKNOWN1) was born March 11, 1884 in Augustine Cove, Prince Edward Island, and died November 01, 1962 in Fall City, Washington. He married (1) HELEN. He married (2) SYLVIA BELLE PRESCOTT November 07, 1914 in Vancouver, British Columbia, daughter of MARTIN PRESCOTT and PARTHENA BUNYAN. She was born May 24, 1894 in Boise, Idaho, and died April 05, 1949 in Snoqualmie, King CO, Washington. i. BUELAH (1)8 PROFIT, b. 1906.
ii. VIRGAL PROFIT, b. 1908.
vi. BEULAH EVELYN PROFIT, b. August 16, 1916.
vii. GEORGE REGINALD PROFIT, b. September 19, 1917, Port Angeles, Washington; d. March 13, 1984, Big Piney, Wy; m. PATRICIA ANNETTE O'BRIEN, December 16, 1939, Fall City, Washington; b. March 05, 1920, Denver, Colorado; d. April 24, 1995, Big Piney, Wy. viii. LEWIS FRANKLIN PROFIT, b. September 20, 1927. 85. EUPHEMIA JANE7 PROFIT (BENJAMIN BEARISTRO6, JAMES REGINALD5, WILLIAM4, WILLIAM3, JOHN2, UNKNOWN1) was born March 25, 1894 in Augustine Cove, Prince Edward Island, and died in Maine, USA. She married LAFOREST CLIFTON BROWN. He was born March 03, 1886, and died May 06, 1930.
i. LAFOREST CLIFTON8 BROWN, m. MADELYN IRENE NIXON.